The Sassanid Archaeological Landscape of Fars region covers monumental buildings, inscriptions and other relevant relics of 3 main cities of the Sassanid Empire. 8 archaeological sites in Firuzabad, Bishapur and Sarvestan have been inscribed. If ever nominated, this site would cover archaeological remains of the last pre-Islamic Iranian dynasty – the “Sassanids” (AD 224-651) whose empire stretched to the Levant, Central Asia, E Arabia and Turkey/the Caucusus. Succcessors to the Parthians, they too were involved militarily across their entire period against the Romans in the form of the Byzantine Empire and, having fought them to a mutual “standstill”, were in no position to oppose the new threat from the south of invading Arab Muslims, who largely overcame them in a period of just 4 years from 628-32 and changed Iran for ever. The 3 “cities” are situated around 100kms west (Bishapur), south (Firuzabad) and east (Sarvestan) of Shiraz. In May 2015 We visited Bishapur and Sarvestan, and I somewhat regret not having taken in the 3rd at Firuzabad, which, from what I have read, possibly contains the “best” remains! Sarvestan can be covered very quickly as it covers just a single building from 5th C AD. Although it is titled a “Palace”, its actual function isn’t understood. Its isolated location is quite appealing and its twin domes and iwans are, apparently, of some significance architecturally, involving “squinches”! My review photo is chosen purely to try to "show off" what are the building's most famous features - though I understand if they don't impress!! Sassanian architecture is of historical importance both for its innovation and also its incorporation of influences from e.g Byzantium and for providing a number of concepts which were later taken by the conquering Arabs into “standard” Islamic architecture. Unless you were a real “Iranian architecture” fanatic it wouldn’t IMO be worth going out of your way for but, if you are going east on the Shiraz – Kerman highway anyway you might as well take it in! Which takes us to Bishapur, the remains of the capital of the second (and usually considered the greatest) Sassanian king – Shapur I (241-72 AD). The UNESCO Web site’s T List description consists solely of the city’s name but one must assume that any inscription would also include the nearby bas-reliefs in the gorge of Tang-e Chogan. Bishapur is another of those Iranian sites where you will find yourself paying several entry fees to visit what is essentially a single entity. So – 200k rials for Bishapur archaeological site, 80k for its museum and 150k for the bas reliefs = cUS $14. The remains of the city are fairly minimal. A bit more than those at Susa but, as with Susa, you will need to visit the Louvre to see the decorations removed from the site!! These consist of mosaics whose style well demonstrates the contacts between the Sassanians and Byzantium. 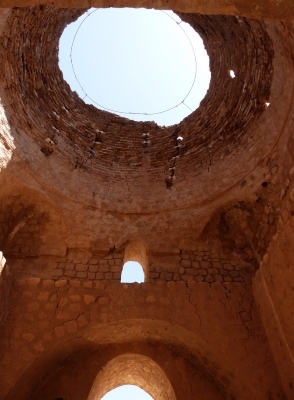 It appears that the captured Romans who were used to build the water system in Shushtar were also used to build and decorate Shapur’s capital. The most identifiable building within the site is a large square structure with a lower level “pool” which has been identified as “Anahita’s Temple”. This, a reminder that the Sassanids were Zoroastrians and we were to see Anahita Temples at a fair number of the pre Islamic sites we visited in Iran, including Tahkt-e Soleyman. We paid the extra for the museum, partly in the hope that it might contain some significant mosaics – it didn’t. But it did give us the chance to talk with the site “Archaeologist” – An Iranian lady whose education and status confirmed our growing understanding that the role of women in Iran is rather different from than that of downtrodden, hidden, hijab covered and uneducated chattels which unfortunately is the case in many countries to the East and south of Iran. OK – hers was not of course the most “powerful” job in Iran but it was typical of a number Iranian woman in “middling range” jobs we came across. Indeed our tour agency was owned/run by a woman. Their status may well be a long way from the “ideal” model of western feminism but, on the whole, we found them to be as well educated and often more assertive than their male counterparts (indeed in the case of many school girls who spoke to us, their English was even better – reflecting, possibly, a similar imbalance in educational attainment between the sexes in Western countries which also tends to lead to better performance there by young females). What we could never get to the bottom of was how such clearly intelligent and capable women could apparently willingly accept practices such as their “word” only counting for half that of a man in court and their inheritance rights being similarly restricted! Even our guide couldn’t really explain it. I suspect that, despite the religious interpretation given to the practices, in their hearts, many do not, but, that, as everywhere, there is a limit as to how far most people will go in opposing culturally imposed norms. We asked the archaeologist whether any progress was being made towards gaining inscription for the Fars Cities and gained the impression that nothing really was happening and that, indeed, the “service” was facing financial restrictions which would prevent necessary work towards such an objective, taking place. We then drove to the nearby Tang-e Chogan bas-reliefs. One of these is “free to view” by following the minor road up the valley from the Bishapur side - soon, on the right, you will see a fenced off area in front of the cliffs with a pair of reliefs showing the investiture of Shapur I and his victory over various Romans in a single “non historical” scene. You will soon get to recognise the picture of the Roman emperor Gordian III being trampled by horses hooves and his successor “Philip the Arab” kneeling before Shapur “begging” for forgiveness (he did actually make a reasonably “fair” peace with the Sassanians). Wonderful “propaganda”!! 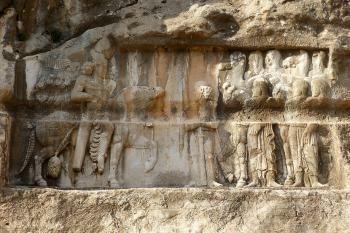 Similar scenes are repeated in the other reliefs here, at Naqsh-e Rustam and at Taq-e Bostan. The entry point for the others is evident from the Bishapur car park across the bridge on the northern side of the river. Here are 6 reliefs in largely fine condition (though one was recently vandalised. See http://www.payvand.com/news/11/dec/1116.html ). Here are more scenes of Shapur I and poor old Philip the Arab, but also of Shapur II!! (Site photo). They also include ones of Sharpur receiving his authority from Ahura Mazda – the supreme God of Zoroastrianism. If you are pursuing Iranian WHS and T List sites, you are going to see a number of bas-reliefs placed in prominent positions along trade routes by royalty of various dynasties for “public consumption” to emphasise their competence and glory. This article sets this particularly (but not of course uniquely) “Iranian” concept in context. Note the high regard accorded to the Sassanid flowering of this art form. Sassanian remains are quite well represented on Iran’s Inscribed and T List. I am not sure I would go out of my way to visit Bishapur but, if you are passing near by between the Shushtar area and Shiraz (it is around 10kms south of the direct road) I would certainly recommend stopping off to see at least the bas-reliefs – even though you may well be seeing others. Monumental Monoliths: The Collosal Statue of Shapur I was carved out of a stalagmite.